Heavenly, Light-Filled Mountain-Top Masterpiece, Soaring Open-Beam Ceilings, Window Wall Views of Mountains and Redwoods, Hot Tub on Mountainside Deck with Epic View, Sunny Acre with Fenced Yard, Pellet Stove. Wi-Fi, Landline Phone, Cable TV. Keyless Entry. 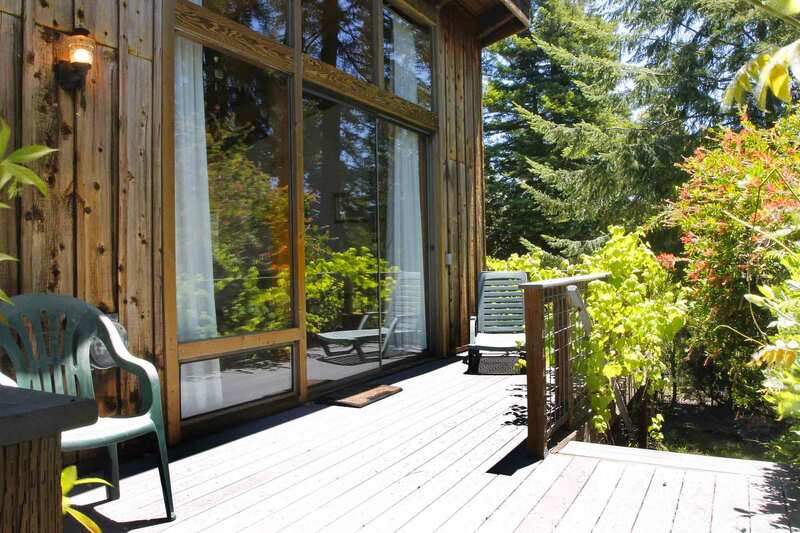 Short Drive to Downtown Guerneville, River Beaches, Wine Tasting, Golf, Coast, Hiking. Your Well-Behaved Dog is Welcome! Arcadia's main living space is open plan with the living room, kitchen, and dining area all facing the ceiling height view of forested mountains. Past the dining area, the master suite has a full bath and its own wisteria-covered deck. At the other end of the living area, off the living room, there's a bedroom a half bath. Both the half bath and the bedroom open to the shower room. Beyond the shower room, there's another bedroom, which has its own entry from the front of the house. Off the living room, there's a fully fenced yard with lawn areas, patio with outdoor dining, and garden with seating under the redwoods. Beyond the patio and garden gate, there's a short path to the fairy ring hot tub deck. There's a large, paved parking area at the front of the house and a short path up to the meadow, a flat grassy 1/2 acre with picnic table under trellis and other seating. The detached cottage (no bathroom) is across this driveway from main house. House is approximately 2500sf. Please note that the private country road to this home is windy, narrow and steep (1/3 mile). There is also a short but steep incline inside the fenced yard. Note that woodstove in master bedroom photo is decorative/non-operational. Max Occupancy: 8. Max Automobiles: 3. Quiet Hours 10pm-7am. No outdoor amplifiied sound at any time. "awesome location on top of a beautiful hill"
Home has an awesome location on top of a beautiful hill with a great backyard and great family room area. Layout of house is sort of strange, but nothing that’s bothersome. Great value, lots of beautiful space, good for small-mid sized groups! Amazing view and very cozy house with everything we needed. Would stay again for sure! Perfect spot for a friends weekend away. Secluded beautiful spot with easy/quick access to town , spacious rooms, cozy fireplace, and a full kitchen which allowed us to cook multiple meals. Definitely took advantage of the hot tub which has an amazing view!!
" I would recommend staying here!" Had a fantastic time at Arcadia with my family. It rained most of the weekend and we kept cozy by the stove or in the hot tub. The kitchen was spacious for us to cook in together. There was also plenty of great food and wine a short drive away. The place was all around great and the only thing I’d keep in mind is that one of the bedrooms is accessed through a bathroom, so it requires some good communication. I would recommend staying here! "A gorgeous and cozy escape"
This place was absolutely perfect for my 30th birthday celebration! A gorgeous and cozy escape - the rooms were spacious, the views were amazing, and there was plenty of space for decorating and entertaining. The only slight downside to having a house high in the hills is that the road up is incredibly steep - one of our cars had trouble making it up, and walking up the road to get to the house was no joke. Make sure you're prepared and come in the daytime, and make use of a car/taxi if necessary (unless you love a good hike!!) Otherwise, everything else about the house was perfect and I would love to come back! The hot tub, warm blankets, Alexa system, and DVDs were so fun! Russian River Getaways was great - they were professional, flexible, responsive, and incredibly clear with their instructions, and they made everything so easy. I would definitely recommend this place to anyone and would love to come back soon!! Thanks for everything! "Great spot with awesome views." Great spot with awesome views. House layout is a bit funky, but would definitely stay here again. Also echo other reviews that recommend getting there before dark - there's a long, steep, winding road to get to this place. "Lovely, comfortable place with a fantastic view." Lovely, comfortable place with a fantastic view. 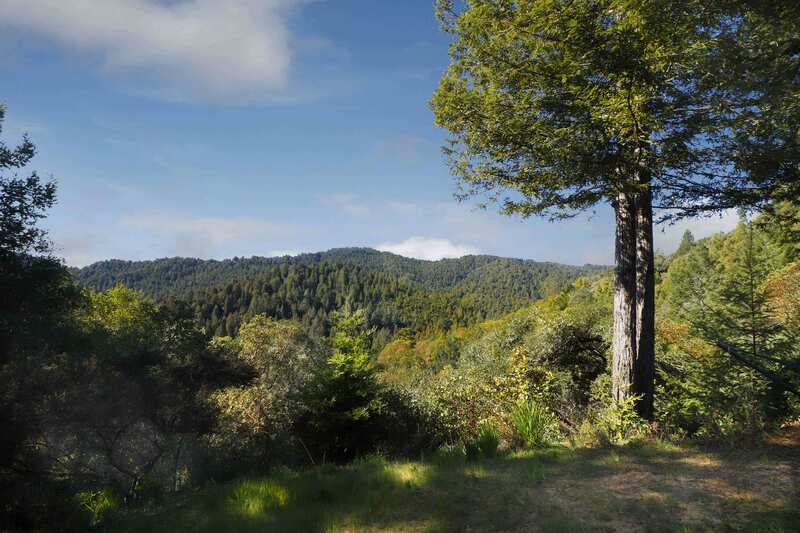 "Gorgeous views in a private location"
Gorgeous views in a private location but still very close to town and the best of what the Russian River region has to offer (wineries, great restaurants, etc.)! Location is beautiful and the views are amazing. The staff is incredibly responsive and was attentive to our needs. What a view! A couple of my girlfriends and I stayed at Arcadia for my birthday with the intention of having a nice relaxing weekend. We definitely succeeded due to the breathtaking view off the back patio, the spacious, comfortable home and the hot tub looking out onto the sunset. The house was great to lounge in the backyard and cook (Safeway conveniently located right down the driveway) and enjoy the quiet. We had a surprising but awesome stare-off with a grey fox who meandered into the backyard while we hung out on the patio. The house is conveniently located, relaxing, peaceful and well appointed. Communication with the rental office is easy and transparent. They are very helpful. 11/10 will book again. This place is really good and we would definitely go back again. We stayed with 4 adults, 2 babies, and a dog. As noted in other reviews, there is an occasional smell that seemed like a gas leak or rotting food. On our way out, we also noticed it outside, which makes me think it might be related to the septic system. Also, as noted in other reviews, the refrigerator would occasionally leak and leave a puddle on the floor. It was also pretty dusty, particularly on the ceiling fans and fake plants. But, the views were really nice, and the hot tub was wonderful and relaxing. The bedrooms are big. Great views! Would have been 5 stars apart from a broken iron and bedroom fan that wouldn’t turn off no matter what we tried ..! "hilltop hideaway, with spectacular views"
This is a great hilltop hideaway, with spectacular views (just as good as advertised) and a sweet hot tub in a redwood grove. Just minutes from Main street--walkable if you don't mind a steep hill--and from Armstrong Redwoods and the other spectacular natural and viticultural attractions of Sonoma County. Architecture is interesting and provides a good basis for conversations ranging from "wow, cool!" to "why the heck did they do that?" (Why is there a doorbell to the second bedroom? Why is the very attractive marble shower in the hallway? Why does the curtain wall of windows in the kid's room face the driveway and not the redwood-covered hillside?) The place feels lived-in in a homey, good way--not a bland, ikea-covered rental-only property--and is wonderful place to unwind, cook some nice meals with the well-stocked kitchen, and enjoy the scenery.
" perfect viewing spot for star gazing!" "Outstanding location, quiet and secluded with a spectacular view." Outstanding location, quiet and secluded with a spectacular view. Be prepared to drive a steep, windy road on the way up to the house, though! "An amazing place with beautiful views and dog friendly!" "This is a very peaceful location"
This is a very peaceful location. The hot tub is great and the views don't get much better.
" The view is fabulous, the house is large and accommodates a family nicely. " We enjoyed our stay but felt that the house should be in better shape for the price, both the furniture and overall cleanliness. The view is fabulous, the house is large and accommodates a family nicely. The hosts were responsive.
" close to town while still offering hilltop privacy and stunning views"
The location of this property is by far its greatest asset. It manages to be close to town while still offering hilltop privacy and stunning views – made possible via a quickly-ascending, winding one-lane road. Sitting in the backyard (or in the hot tub) at sunset is definitely where you realize how special this place is. The room layout is unusual, but manageable. Most of the finishes are a bit old, except for the standalone shower which seems newer and is quite nice. Our only main issues were in the kitchen, where the sink was leaking onto the countertop and the dishes from the cupboards were quite dirty, needing to be rewashed before use. Overall, we had a great time at Arcadia, and we would certainly consider staying here again. "Arcadia is a fantastic retreat"
Arcadia is a fantastic retreat. 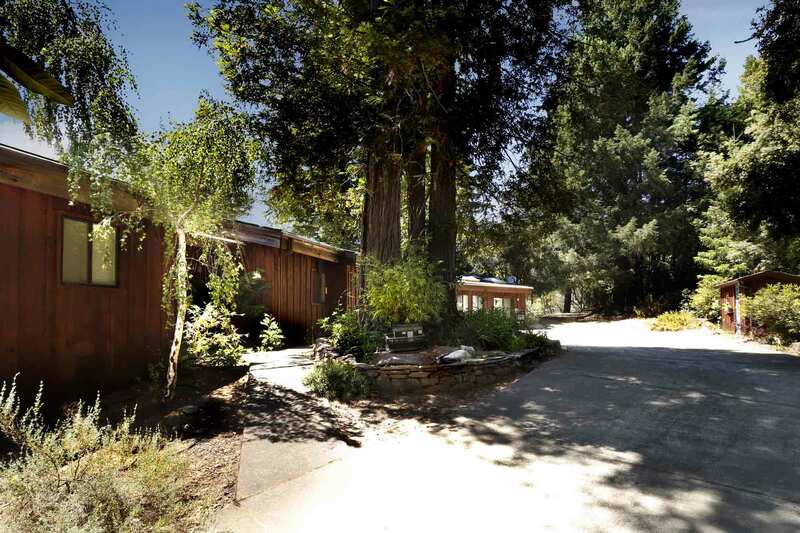 So close to Guerneville but secluded and remote at the same time. It's an ideal getaway from SF. Location location location! If you’re looking for a house that you just want to stay in the whole time THIS is the one. It’s somewhat secluded and the view is breath-taking, we all felt so at peace the whole time we were there to the point where we dreaded leaving, we left at the very last minute of check-out! Despite some electrical issues in one room and the couch bed not being very good, the small details down to the tiny trinkets on shelves were so fun and fulfilling, we really truly felt at home and in a dream while we were there, in the hot tub, on the hammock and just eating together on the back patio. Beautiful house, beautiful area, worth EVERY dime. "Arcadia is a fantastic retreat. " Amazing house! We had no issues at all. They made it so easy to access the home completely stress free. We had a great weekend and I would highly recommend this home. We had a great stay! The view from the outdoor terrace is beautiful. "Gorgeous views, well-stocked, spacious house with an excellent location"
Some friends and I came to stay in Arcadia for a celebration weekend and the house was perfect for us. The views were incredible, the location of the hot tub equally so, and the house itself was spacious and extremely well-stocked. We took full advantage of the kitchen and the outdoor grill. Will definitely be back- thank you! Loved this place! The fixtures are a bit dated, but we enjoyed the fire place, hammock, and hot tub immensely. Good value and location. What lovely and private location for a getaway. Watching the fog and clouds move across the valley and tree covered hills from the patio or the hug windows as awesome. The hot tub surrounded by redwoods was so peaceful. The kitchen is well equipped. Everything we needed for gourmet meals for a group who loves to cook. It was warm and cozy sitting round the pellet stove in the evenings. The only thing to be aware of is that the bedroom with the twin beds is accessible though the shower and bath room. So consider that when you are thinking about who you group is. It worked just fine for our group of two couples and 2 single women who are very close friends. The host is excellent at communications. I had a number of questions as we prepared to travel and they were super responsive. Spacious house on the edge of the forest. Absolutely beautiful views, especially from the wonderful hot tub. There were four of us and we were so pleased at how much personal space each of us had. "Great host & location. " The house is situated in a truly idyllic location, the views are spectacular, and the outdoor space is really nice to relax and soak in the surroundings. The hot tub and hammock along with the patio space were great to hang out in. Also, the living area had great space to play games or cook for a larger group. The only downside to the property is that some of the spaces of the house are dated to the point where it felt unclean and/or concerning to our group. Mildew in the carpeted bathrooms, leak underneath the sink, and simple things like drawing the curtains or trying to change the speed on the fan and we would easily break. Simply put, some of the original design and fixtures of the house aren't really holding up and make for unsanitary or concerning conditions. Having said that, I would recommend this for a group, as we had a great time. It was really beautiful, secluded, and we were able to have the space we needed. My only suggestion is to keep those things into consideration for future visitors. So glad you enjoyed Arcadia, Toshi, and hope you'll be back soon. Thanks for the review! "A wonderful, tucked away cabin..."
A wonderful, tucked away cabin with delightful views. Very comfortable and close to great food and coastal activities. "Beautiful home in Guernville. " Beautiful home in Guernville. Favorite part was the incredible view in backyard...trees everywhere! Air quality is amazing. Beware the road leading up to the house though-especially in the dark! This location was breathtaking! Yes, it's a steep road for about 1/3 mile so I would advise going in the daylight the first time. It was a very comfortable house to stay in. We had six in our family and there is more than enough room. Time on the patio was peaceful and fun. Hot tub a plus. The amenities were great. A new outdoor bench is needed or remove the photo of it as it is too weathered to sit on. A couple of the kitchen bar stools were not the most sturdy so be careful. I would highly suggest removing the carpet from the bathrooms to keep sanitary. Even with these minor things, I would highly recommend the property. Thanks for the review and feedback, Diane! We're so glad you enjoyed your stay at Arcadia! The house is presented accurately. Great views and lovely grounds. The inside is dated: carpeted bathrooms and older fixtures and amenities (linens, specifically). But what you get is fair for the value. The drive up is harrowing at first, but we got used to it quickly. The hosts, River Getaways, are great. Response time is quick and courteous. They are informative and made checking in and out very easy. Professionals through and through! "This place was perfect for 6 of us!" This place was perfect for 6 of us! While the road is steep- it is paved and we didn't have any problem getting there. We even walked down to Johnson's Beach one day from the cabin with no issues. The space is perfect for a group with a large shared area and then giant bedrooms. Outside is gorgeous- we grilled and hung out on the patio our first night. The hot tub was also great! The place definitely has a cabin feel and an older vibe (carpeted bathrooms) but was perfect for us! To access one of the bedrooms you have to pass through a shared bathroom which could be an issue with a lot of people in and out of the restroom but didn't really bother us! I would definitely stay here again. Thanks so much for the review and feedback, Sarah. We're glad you enjoyed Arcadia and hope you'll be back! "The place was so cute and rustic..."
The place was so cute and rustic, but also very comfortable with stunning views. My family had a wonderful stay here. Communication was very easy as well. I highly recommend it to anyone looking for a place in the Russian River! Thanks for the great review Bram! We're super glad you enjoyed Arcadia! The house conditions were exactly as expected. The place is dated and could use some maintenance but it was clean. We had a couple of issues which required a call to the management company. They responded quickly and everyone we dealt with was very friendly and helpful. The house itself has an interesting and cool layout. It was a treat to relax in the hot tub and take in the scenery. The views are AMAZING but come at a cost (see next paragraph). The only real downside to the stay was the drive up to the house. Once you turn off the main road it is a very, very steep, narrow, windy road with holes and bumps. It requires you to drive in a low gear and when neighbors park on the road it becomes challenging to get around their cars safely. The road is so narrow two cars cannot pass and the vehicle proceeding down is forced to reverse back up the hill. This drive is not for the faint of heart and requires good technical driving skills. We had intended to go wine tasting and have our teenage driver be the designated driver. However, we had to change our plans as she wasn't skilled and confident enough to drive the road up to the house. This is a super home up in the hills, surrounded by trees. Plenty of room for guests. Big, open kitchen. Large floor to ceiling windows facing forrest. 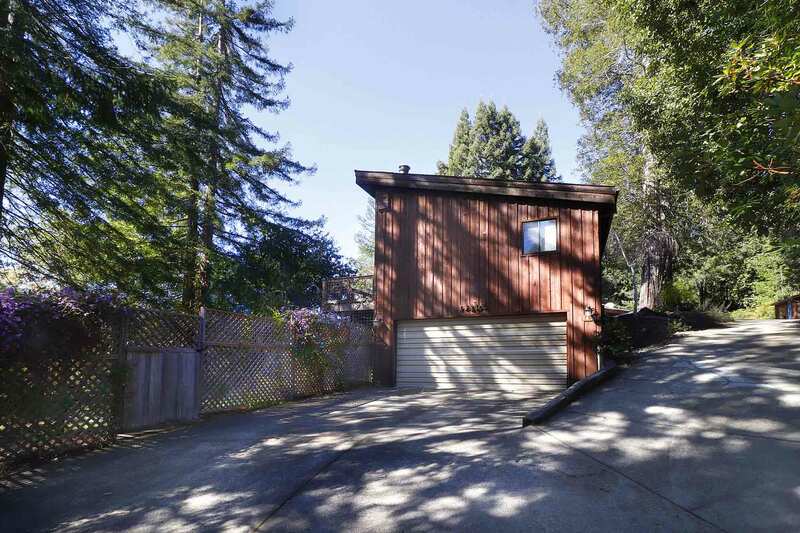 Location is close to wineries and located in Guerneville. Peaceful, quiet location with backyard view of a small valley. Beautiful! Inside, beds are comfortable. Plenty of seating for guests. "The house was perfect for a week-long getaway..."
The house was perfect for a week-long getaway for our family of 5. The views and hilltop setting are beautiful. 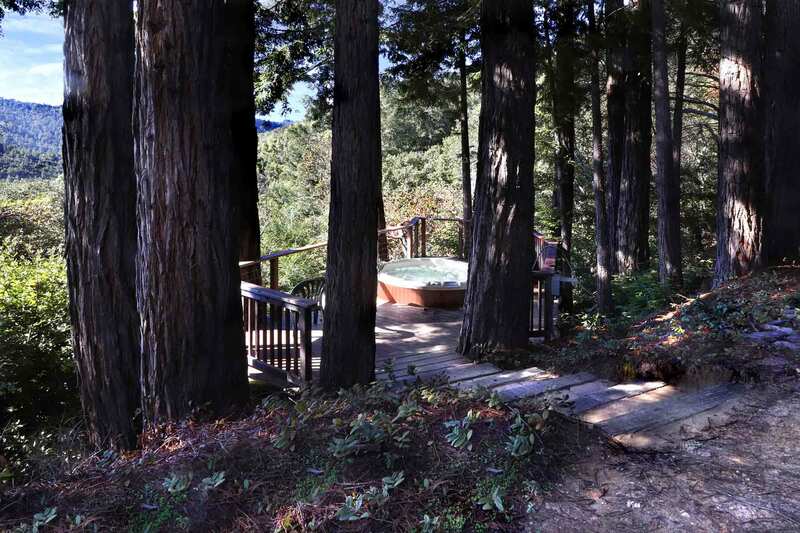 The hot tub under the redwoods was great for grown ups and kids. Everything in the house worked and was clean. Plenty of space (bedrooms are huge). The kids especially liked talking to the Amazon Echo. You have to walk though a shared bathroom to get to one of the bedrooms. This was fine for us, but could be a consideration for others. Overall, great place. Great place! Quaint and spacious. Great mountain views. 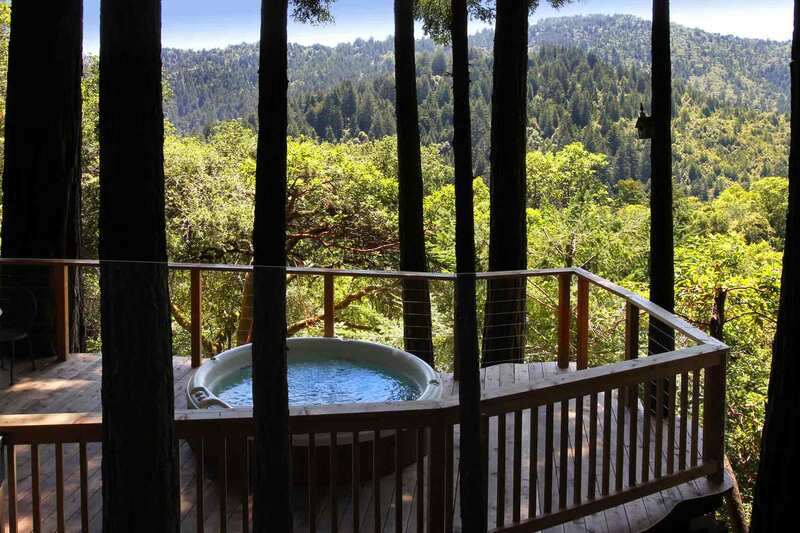 Hot tub is spectacular, outside under redwood trees! Beautiful place. Felt very private. Will definitely be back again! The best part of our stay was the gorgeous views from this house. We had 8 guests but the house was nice and roomy so it didn't feel like we were on top of each other. Could use a few more towels and pillows but other than that it was a good experience. Very close to downtown but felt secluded and private. Would absolutely recommend or stay again. Thanks so much for the review and feedback Meredith! We're so glad you enjoyed Arcadia and the surround area. Beautiful house, beautiful view, comfortable, and a great location. Can't go wrong with this one! The place is amazing. Great views and very comfortable. Very close to river and town. My only complaints (easily fixable): 1) Ad says it sleeps 8 but only six people can sleep comfortably in a bed. 2 would have to either use a sofa bed or a floor mattress. 2) The kitchen does not have any basic supplies such as salt and pepper! 3) The lock for the hot tub was really hard to open. Other than that, we had a great stay! "The property has amazing views." The property has amazing views. It is quiet and perfect to unwind from a city life. The master bedroom is really big and cozy. There is a safeway very close by for any needs. I would come live here again! "Wonderful stay in a special house! " We had an amazing weekend at ARCADIA! Weren't sure what to expect when we drove in on a rainy night up the steep hill to the house, and were thrilled with place - it's even nicer than the photos! Totally comfortable and really cool mid-centiry modern design and decor. Gorgeous views, and really nice to be so close to town as well as hikes, etc. We were traveling with kids and this place was ideal. I hope to come back soon! I can't recommend this place highly enough. The scenery and the hot tub are simply spectacular. The house is very spacious and well-equipped. Perfect for a large family or a group of friends to relax. "This house has the most incredible views." This house has the most incredible views. Our favorite spot was in the hot tub and patio just gazing out. The correspondence with Hunter was quick and efficient-- we would come back here ! The space was serene and spacious, Amazing view from the hot tub. Large bedrooms, and common space, well equipped kitchen. Will go there again for sure! We (4 adults and 4 dogs) stayed for 3 nights at Arcadia for a birthday getaway celebration. The incredible views from the home provided a magical setting for the weekend. Pros: Incredible views, well-stocked kitchen, very spacious and comfortable home, wonderful hot tub situated in a redwood grove, cooled off very nicely with all of the fans and lots of sliding doors and available windows (in spite of it being 90 degrees that weekend, and the home having no a/c) and we absolutely loved that we could bring all of our dogs and they could enjoy the fenced-in yard! And eating every meal outside on the patio - just lovely.Cons: Uncomfortable mattresses, dirty dishes upon arrival, old sliding doors that don't slide smoothly anymore, grill does not work very well (high setting cooks like low), and overwhelming rule book (there is even a rule written in the rule book telling you not to rearrange the pages in the rule book...)Neutral: Dated interior - this house has a funky 1970s feel. Might be your thing, might not be. Quite a few spiders inside of the home - we live in a secluded area so we are used to that kind of thing, but it might bother some renters. Steep switch-backed 1-lane road up to the home. Again, we live in a secluded area on a one-lane road so this didn't bother us, but I am sure it would be bothersome for some renters. Excellent getaway for a family of 4 plus grandma. The young folks enjoyed the hot tub soaking while watching the stars. Grandma enjoyed the early morning fog come up the mountain as the full moon set into the mountains. Very private. Drive has a key code gate and goes switch back up the mountain. The minivan made it okay. Russian River Getaway support phone number was very helpful with any problems. Only trouble was the sliding screen doors were ancient and did not fit or slide very well. Ceiling fans kept it cool. Guerneville CA is a hoot! Armstrong Redwoods state reserve just down the road is AMAZING. Winerys and wine tasting everywhere. Heaven. This is a large, secluded property with everything you could want to enjoy your stay. It's about a mile up a very steep and windy hill, which is both a plus and a minus. It's secluded, which is great and has gorgeous views of the valley and surrounding hills, but the road up to the property feels treacherous if you're not used to such a thing. There are a few condition issues with the home that you'd expect an owner to stay on top of (large cracks in the great room tiles, really dated interior), Utensils left at the home are clearly left-overs or garage sale finds. They were adequate, but not quite what I expected from what I considered to be a luxury rental. We stayed for 3 night at arcadia during a wine road event. If was very clean and comfortable. The kitchen was well equiped and the pellet stove provided a warm and comfortable place to socalize. The hot tub was very warm and we enjoyed it a great deal at night. I hope to returnnext year. "Wonderful rental in the trees"
We stayed here for a girls get-together for two nights. Everything went perfectly. There are ample dishes, glass wear, etc. 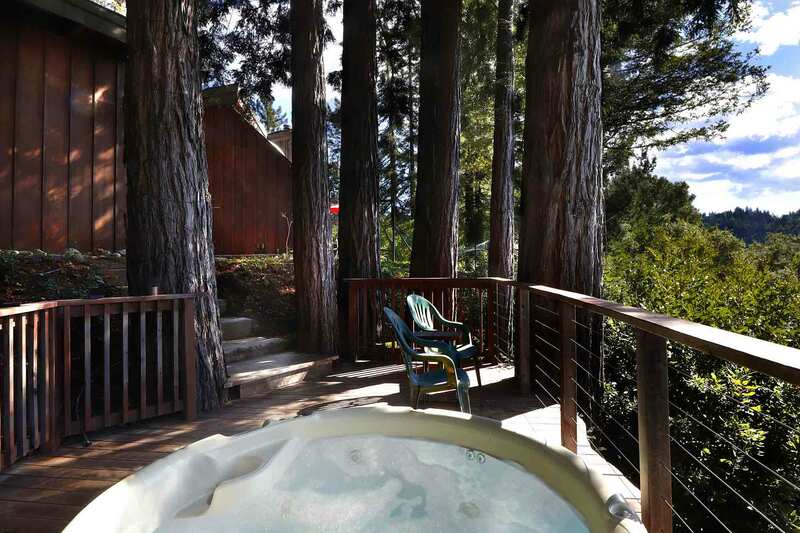 The hot tub was a highlight for us as it is situated right in the middle of a ring of redwood trees. We were worried it wasn't hot enough at first, but it was fine. The view from the hot tub is amazing! So many trees.The only criticism we have would be sooo many rules on the Information Sheet coming from the property manager. Perhaps it's a necessary evil as there are those who don't take care of another's property, but all the threats of fees for violations were a bit off-putting. Besides that, great place and we would rent there again.One of the girls left a swimsuit in one of the bathrooms and management was kind enough to locate it and mail it to her. We really enjoyed the home. Our daughter and her family joined us for part of our 3 week stay. The house is perfect for 2 families. The location is beautiful - the views from the windows are beautiful. We had only one real problem. Not enough hot water. After one person took a short shower, there wasn't any hot water left. After service people came to correct the problem, we still did not more hot water. The people at Russian River Getaways were really nice to work with and prompt to any requests we made. We're so glad you enjoyed Arcadia. Not sure what happened with the hot water, as we couldn't replicate the problem, and there have been no complaints since. We do hope you'll come back again. This rental is so awesome, we've rented it for next year, as well. The home itself is clean and well-maintained...very comfortable for 6 people. The fact that you're on top of a hill, with hawks flying eye level with you, and not another soul to be heard...amazing. We're definitely looking forward to our summer vacation next year!